A screw is a mechanism that converts rotational motion to linear motion, and a torque (rotational force) to a linear force. It is one of the six classical simple machines. The most common form consists of a cylindrical shaft with helical grooves or ridges called threads around the outside. The screw passes through a hole in another object or medium, with threads on the inside of the hole that mesh with the screw's threads. When the shaft of the screw is rotated relative to the stationary threads, the screw moves along its axis relative to the medium surrounding it; for example rotating a wood screw forces it into wood. In screw mechanisms, either the screw shaft can rotate through a threaded hole in a stationary object, or a threaded collar such as a nut can rotate around a stationary screw shaft. Geometrically, a screw can be viewed as a narrow inclined plane wrapped around a cylinder. Do you feel prepared for your next test? Find out by downloading our ﻿﻿﻿﻿FREE mechanical eBook﻿﻿﻿﻿! 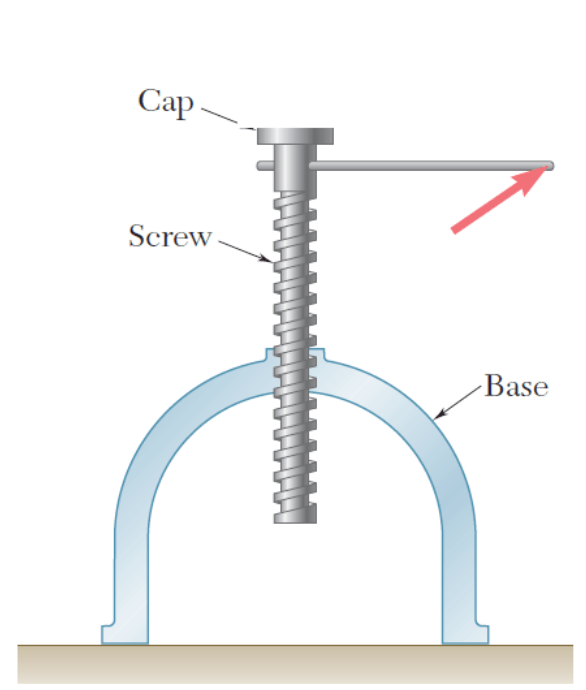 The screw shown in figure has an overall length of 0.25 m, it's made of 250 revolutions, what is the pitch of this screw? The pitch of any screw is defined as the length divided by the number of revolutions within that length, that equals to 250 mm / 250 revolutions = 1 mm pitch. The gear C has a number of teeth of 40, what has to be the pitch of the mating screw? Gear teeth are spaced 1.256 / 40 meters apart, that is equal to 0.0314 m (31.4 mm) and that has to be the same pitch of the mating screw. The following machine consists of a screw that pushes on the shaft to extract a gear out of it, assume this screw has a pitch of 0.5 mm, and the gear is 50 mm deep from the end of the shaft, how many revolutions would you have to make to extract that gear out? C) Depends on the friction between the gear and the shaft. The number of revolutions is equal to the distance travelled divided by the pitch, which is equal to: 50/0.5 = 100 revolutions. 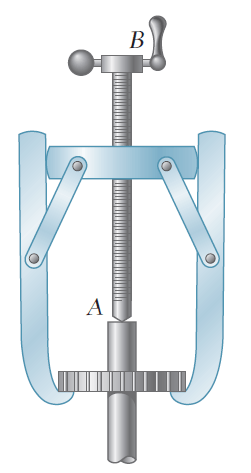 The screw-jack shown is used to lift a load over the cap by rotating the lever around, what do you think increasing the pitch of the screw will do to the effort of your hand on the lever ? By increasing the pitch, we would increase the lifting distance done per one revolution, so that will increase the work, and hence increase the effort needed on the lever. 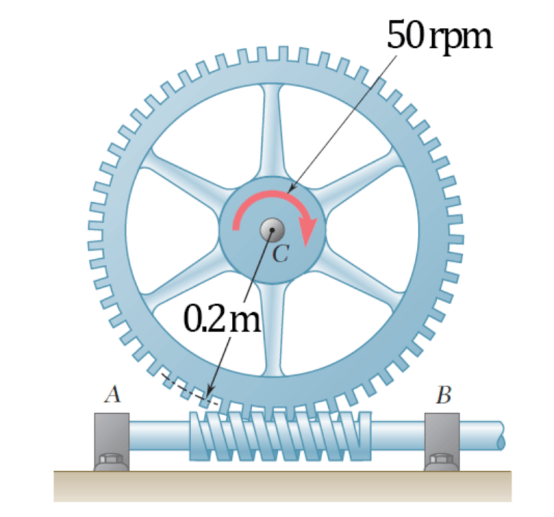 The following screw - gear set has a pitch of 31.4 mm, if the gear C is rotating with an angular velocity of 50 rpm, what would be the angular velocity of the mating screw? Are You READY For Your Test? 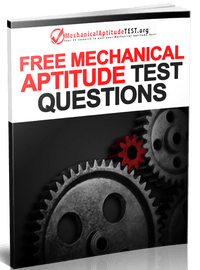 PRACTICE WITH YOUR FREE MECHANICAL APTITUDE EBOOK!